Nelson Mandela has used his 91st birthday to launch annual Mandela Day - "a global call to action for people to recognize their individual power to make an imprint and help change the world around them for the better." Each year the day will be commemorated by calling on people to do 67 minutes of good for the community, 67 representing the number of years since he began his campaign for human rights for every South African. 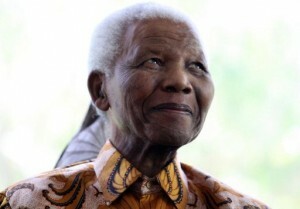 "In recent years, Mandela has stressed that if his legacy is to live, others must take up his causes. His Mandela Foundation, which houses some of his archives and supports community building projects, has switched from a logo featuring his face to one featuring his hands, reflecting his desire to shift the focus from himself to the work ahead. Initiatives such as these are inspirational in their intent to galvanise the masses to "do good", and inspirational as a form of leadership by example. Rather than glorifying his birthday as a celebration to himself, there is something in the choice to use that attention and recognition and turning this into a call for action.